Conduct all types of online exams & tests for remote locations. Our Online exam web solution will serve as an attractive platform for the candidates to take various online tests. Candidates can view all exams details on their dashboard and can apply for it. 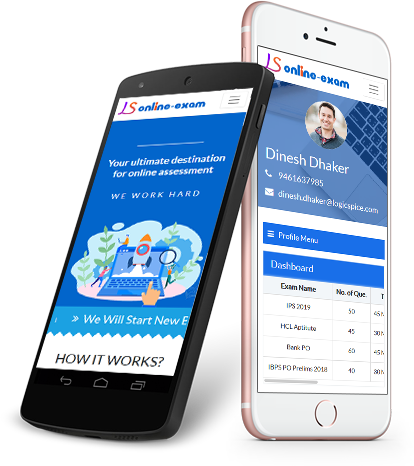 They can see the history of all applied exams and can view detailed exam result and download score card. 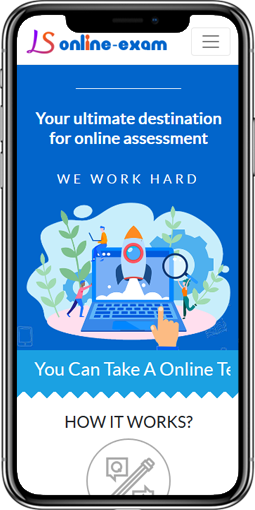 This online exam test script will help you to build online exam test portal where teacher or admin can automate their examination process smoothly. Students or user can apply for that test easily. Student can login securely on the portal using Email Addresss or Google/LinkedIn. Student can view their profile & can manage their Profile. Student can view all test added by Admin for each subject & can apply for test. Student can take online test after login. After applying for the test Student will be able to see the instruction page & once they read all instruction they can start the test. User can view number of applied tests along with all exam analysis details under Exam Histories Section. They can also download score card certificate. 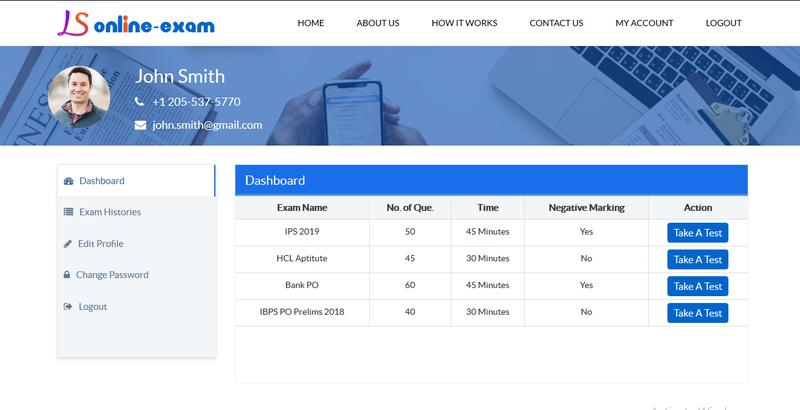 Students will be able to view detailed exam analysis like number of marks obtained, number of attended/not attended questions, number of correct/wrong answers along with score card certificate. Student will be able to view correct answer after submission of the test on View Result page. User will be able to view announcements on the Front page of the Portal. Students can download their score card certificates of all applied exams. 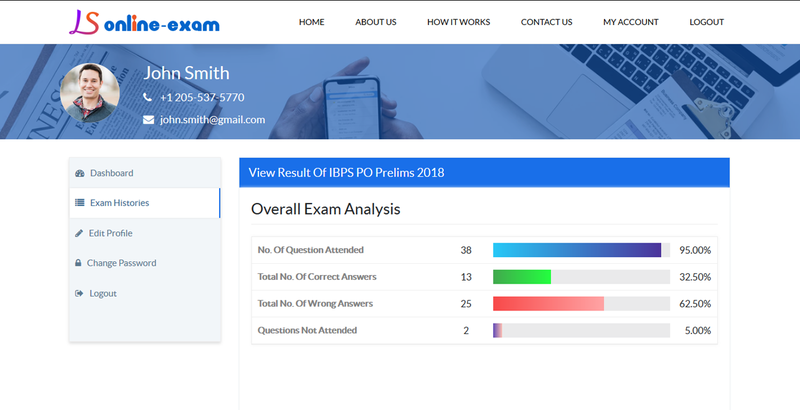 Students will be able to view statistical report of overall exam analysis and detailed exam analysis like total number of questions, number of correct answers, wrong answers, number of attended/Non-attended questions, overall marks obtained etc. Students can view details of recent exams given along with applicant name,their scores. Students can view details like Exam Name,Number of questions,Number of Right/Wrong Answers,Score and date of exam. Admin will be able to login securely on the portal. Admin will be able to view total number of students, subjects, Test Questions, Test Papers, Test Results on their dashboard. Admin will be able to manage (add/edit/view/delete) Username, Email id, Password and can view and edit front end pages content of website. Admin will be able to view list of Students & can manage(add/edit/delete) Students. Admin will be able to activate & deactivate Students profile. Admin will be able to view list of Subjects & can manage (add/edit/delete) Subjects. Admin will be able to view list of Questions with multiple options & can manage(add/edit/delete) Questions with image and without images. Admin will be able to view Test Papers List and can create test papers by adding details like Title, Subject, Time Duration, Certificate Generation (Enabled/ Disabled), Negative Marking (Yes/No). Admin will be able to manage (Add/Edit/Delete) all test papers and can activate/Deactivate test papers. Admin will be able to view the list of students who have successfully submitted tests and can export data. Admin will be able manage(add/edit/delete) accounements which are displayed in student account at front end. Admin will be able to manage (View/Edit) frontend Pages. Admin will be able to manage (Edit/View) Online Test Instructions. Admin will be able to export all Test Results data by selecting date range. What does our Online Test Exam Portal Script do for you? 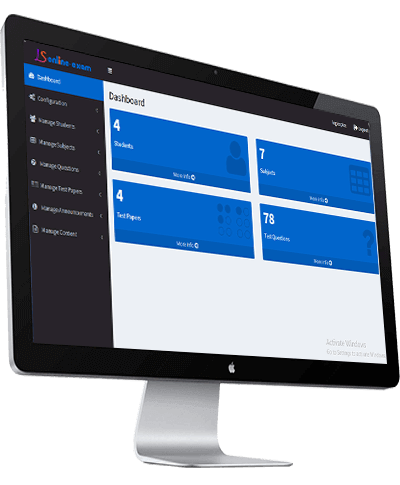 LogicSpice offers Online Test Exam Portal Script to build Online test portal for their Students. Online Test Exam Portal is platform to keep track of student's capabilities and test them. Online Exam portal is essential for Colleges, Universities, Teachers, Professors, Employees, Partners, Technicians. It would be helpful for folks within the educational development of children to enhance their instructional skills. Online Test Exam portal will be User-Friendly, Responsive, Offering several types of questions, Give Scorecard etc. As per the client requirement we can customise the native mobile application. "We needed a customized Online Exam Portal for our Online Exam to manage Users. Logicspice has provided us with the right online solution. Thanks! ""We needed a customized Online Exam Portal for our Online Exam to manage Users. Logicspice has provided us with the right online solution. Thanks!" 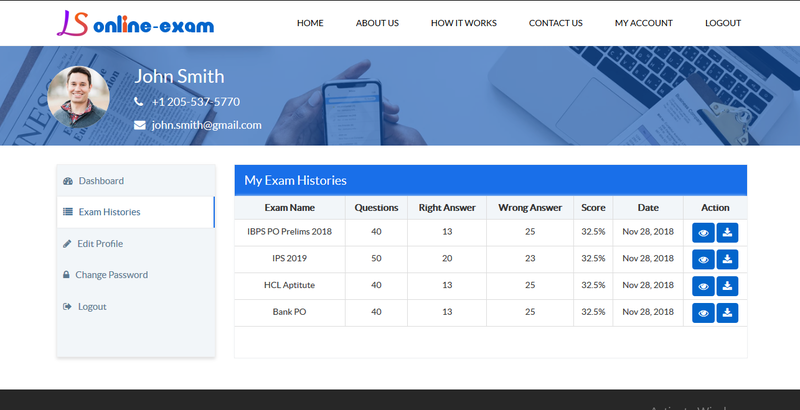 "Recently I purchased the Online Exam Portal Script to launch my own online Exam Software from LS(Logicspice) and it worked really nice. Buying this script was worth as they have provided me with full source code & I was able to customize it. Highly Recommended!!!!!!" "Online Exam Portal was easy to use & useful for My Educational Institute which helps us to create Test for Students"
LogicSpice is the best IT Service Provider. I would highly recommend it for any Institutes or Organization which is looking for Online Exam Portal. How candidate can search for online exams ? Candidates can view list of all exams on their Dashboard. Will admin be able to add test papers ? Admin can manage (add/edit/delete) test papers along with other details. What will be the pattern of Online Test ? Candidate will give the online test in the Multiple Choice Question(MCQ) pattern. Can candidates see Test Result ? Yes, They can see detailed exam result along with all details. Can candidates receive Certificate after passing Exam ? Yes. Candidates can download Score Certificate Copy. Can Candidates register using any social Accounts ? Yes. We have provided Sign Up/Login using Google and Linkedin. Can Candidate see correct Answers? Yes, Candidate will be able to view number of correct answers and wrong answers after submitting the test. Can Candidate see their appeared tests? No, You can’t resell the script. All rights will remain with Logicspice only. Yes,We offer 30 days money back guarantee to ensure customer satisfaction of our products. If for any reason, you wish to discontinue using the product, you can ask us for refund. We will refund your total money except the installation and configuration charges, which is USD 65 or 20% of application cost, whichever is greater. Students can view detailed exam analysis of all appeared tests. Students can start the test after reading instructions. There will be timer for the exam.Students can see total number of questions,attended questions,non attended questions details and can save answers and submit test. Students can see list of all their appeared exams and can view and download score card.